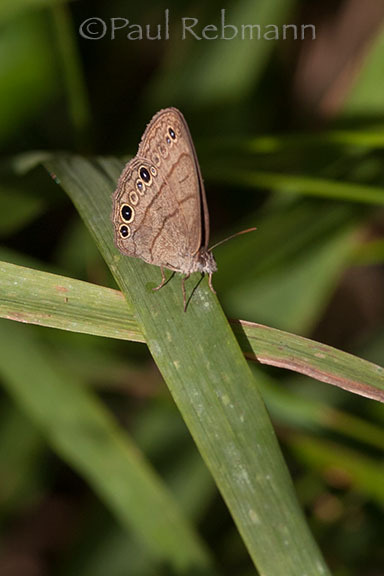 This is a recently described species of satyr butterflies. Intricate satyrs are butterflies that were previously considered Carolina satyrs, which are very similar looking, share some of the same range and appear at the same times of year. The range is the southeastern coastal plain west into Texas and possibly also Costa Rica. Male Hermeuptychia intricata lack the dark areas of androconium on the upper forewings that is present in H. sosybius. There is also a difference between the species in the one of the thin brown lines on the wing underside. In intricate satyrs this line has a noticable bend towards the head near the leading edge of the forewing (this is straighter in Carolina satyrs). Also this line is straighter near the leading edge of the hindwing than it is in Carolina satyrs. Intricate satyrs have a curve away from the head in this line near vein M3, Carolina satyrs lack this curve or it is farther back on the wing than vein M3. Hermeuptychia intricata is a member of the Nymphalidae - Brush-footed butterflies family.